Hatsune Miku 2.0 is Nendoroid nr. 300. Just think about it. There are over 300 types of Nendoroids out there right now. That's A LOT!! I've got to say, I'm feeling ecstatic. When I ordered my first figure from Hobby Search, I recieved her in a box that was a little to big and was full of bubblewrap and those little white corn things. I was disappointed, since the figure box was a little wrinkled (of course it's better if it's not). GSC chose a smaller box and wrapped and taped bubblewrap onto the figure box, so it was in splendid condition. Her box is a little different from the usual Nendoroid boxes. It has a different print design and feels more minimalistic. I kind of get the idea that GSC was trying to appeal to foreigners more (since they're expanding anyway) with the latin alphabet and simpler design, but I gotta say that personally I like the regular Nendoroid boxes more. The quality of the figure is just amazing. The glossy paint makes her look and feel more expensive then the other Nendoroids, which she isn't! And all these accessories! GSC has really outdone themselves. They're kind of TOO many! There are almost countless possibilities for posing her. I don't really have anything to criticize about Miku. She looks polished and gives a vibe of happy charm. The new faceplate system is great (it's so annoying to swap faceplates on older Nendos since the joint often sticks to the body). The accessories are adorable. It can be a little hard to strap the guitar around her, but that's just because I have overly flexible clumsy fingers. 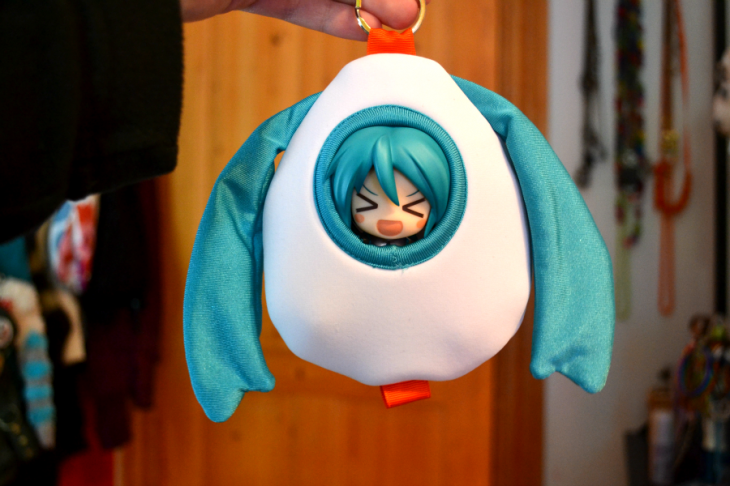 Aaaaand of course since I pre-ordered her from GSC shop (since everyone else was already sold out, I got the 2nd shipment btw), I got this funny little bag to keep her in! By the way, have you guys noticed that on the Nendoroid joints, there are little GSC smiley faces on one side. Miku is so cuuute! and with Gumi the're so funny!! He-he-he I like her funny face too! My congrads to you, dear! Well, to be honest I never ever use it so if you really want it I guess it's okay. I dont live in Russia though, so I'd have send it to you and money transaction could be a little tricky since I don't have PayPal..
Hi! Congratulations to Hatsune Miku! Yesterday I got my Snow Miku, now I understand why so enjoy Nendoroid! Thank you! Congratulations with your Yuki Miku! Really? I'm surprised to hear that. I feel that the Nendoroids are quite sturdy, and thus it's easy to swap parts without worrying about something breaking. The only thing that hints them as fragile to me is how matte they are, making it quite easy to leave scratch marks and scratch off the paint on fx. the ends of hair strands. and i had the longest fight with her hand . it kept falling . so i just put her again in her box haha . Well, that's not really because she's fragile or anything. It's just that the plug and hole for the arms are quite small and short, so the arms which are much much longer don't always have the support they need (and they're probably so short so there's a lower risk of the plug breaking and getting stuck in the arm socket). It depends on the kind of plastic on both ends, the size of the plug and hole and heat conditions how well it sticks. I find that sometimes when it's cold the plug doesn't even fit into the hole or is stiff, while if it's too hot the arm falls off. You might want to try experimenting a bit with blowdrying the parts or put them in the refrigerator for a minute or a half, though of course it's possible that it's simply a manufacturing mistake and either the hole is too big or the plug is too small. 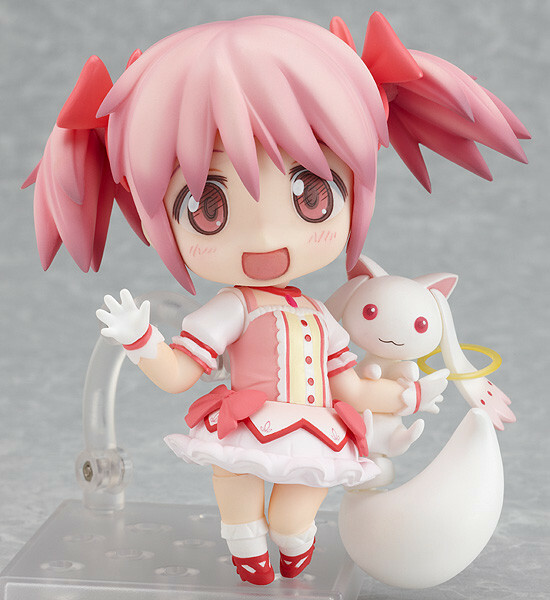 I hope you can fix it somehow, Nendoroid Madoka is such a lovely figure! thanks for the advice, im going to try it soon !! !